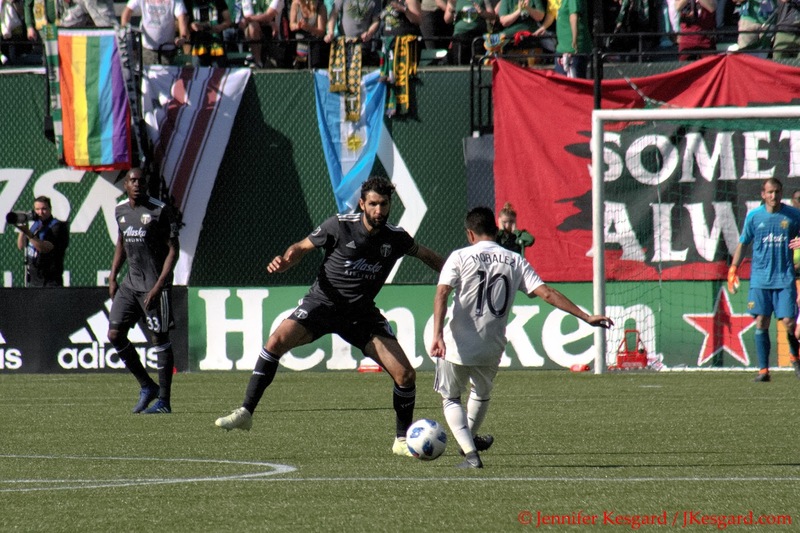 Diego Valeri defends Maximiliano Moralez. Valeri was very active all day. 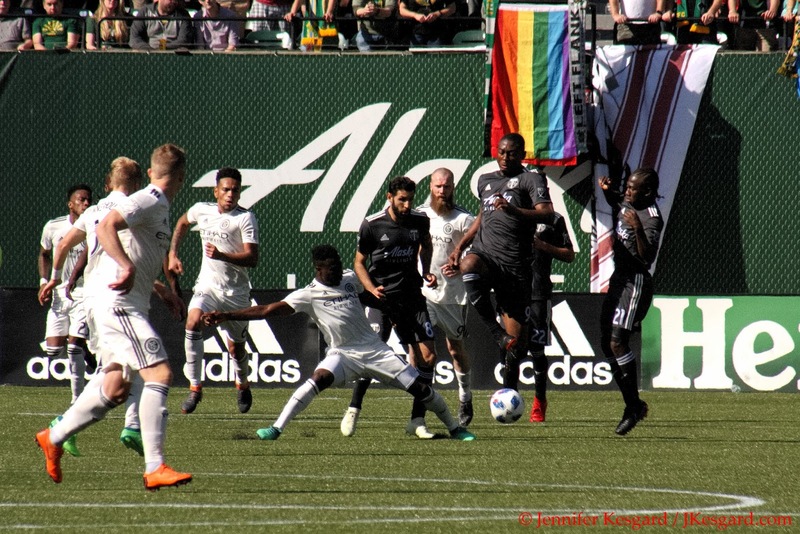 Possession with purpose – we’ve heard this term for several years as the mantra to the Portland Timbers’ offense under former Coach Caleb Porter, and it’s blossomed into various capacities and publications within the soccer world. After the tactical deficiencies that were exposed under the team’s first coach in the MLS era and lightly addressed when Technical Director Gavin Wilkinson stepped in as caretaker before Porter’s arrival, it’s been trumpeted for years that possessing the ball was the key to winning soccer matches in MLS. For 5 seasons, this belief permeated throughout Timbers fans who feverishly devoured statistics about soccer who bought into the strategy, and the results were certainly impressive – 3 playoff appearances, 1 MLS Cup. With Porter off to his next challenge and Giovanni Savarese now the man in charge, there’s been a very different set of tactics employed with the personnel available, as we’ve seen an attempted high press, a complete whirling about, the Christmas Tree – and while we haven’t seen the Timbers completely dominate yet, there have been glimpses of impressive soccer. Until April 22 at Providence Park, where the Timbers put up one of their most extraordinary efforts against New York City FC, the team dominating the Eastern Conference for MLS. NYCFC hadn’t lost in 6 matches nor had even been held scoreless in 2018, putting up 2 goals in each match, yet the Portland Timbers used several substitutions, a different formation and a raucous environment at home to post an imposing 3 to 0 victory. Consider the historic accomplishment of what has transpired in front of a sellout crowd and a nationwide audience on FOX Sports 1 in looking at the statistics of the match: Portland had just 25% total possession for the match with 20% at the half, 249 total passes with roughly 72 percent accuracy in comparison with NYCFC completing 760 passes at a 91 percent clip. No team in the MLS Opta era, which started in 2010, had ever had a possession number so low and not only won the match but shut the other team out until the Timbers pulled it off in calculating fashion. But as pointed out on the Timbers site by soccer analyst extraordinaire Richard Farley, Savarese has been preaching a desire to be flexible in their game approach and not just employ a single strategy or formation. Strategies, personnel, situations could change from match to match depending upon the opponent, and being flexible and fluid would keep the other side guessing. It’s an interesting strategy if a team has the talent, tenacity and total smarts to pull it off each and every week given the length of the typical MLS season, but for one moment in time against a stacked opponent, lightning struck and the Timbers posted a massive result. With the skies clearing under a wonderful spring sun with the slightest of breeze in the air for a midafternoon match, Savarese pulled a different approach to try and slow down NYCFC in setting his starting eleven. After dealing with injuries all season, Jeff Attinella was given his first start of 2018 in lieu of incumbent Jake Gleeson, and Attinella was working with a familiar defensive line. Liam Ridgewell, demonized after a lackluster performance in New York versus the Red Bulls and pushed to the bench for Bill Tuiloma, was promoted back to the starting eleven alongside Larrys Mabiala with Alvas Powell and Zarek Valentin manning the fullbacks. This quintet of defenders had actually appeared several times in 2018 and responded well in most occasions, but with Ridgewell out of the doghouse and Attinella making the first start, you could question the selections a bit. Savarese further altered the approach with putting out 4 midfielders – Andres Flores and Sebastian Blanco on the wings and Cristhian Paredes as defending midfielders – with Diego Valeri as the lone attacking midfielder and Fanendo Adi as the lone striker. The approach appeared to be bunkering at first, but in watching the tactics unfurl, the lineup was designed to absorb pressure and tempo and exploit counter attacking chances whenever possible with the wings or fullbacks pouring forward. This system would only work if the Timbers could work as a foursome on the defense and midfield lines through synchronicity and communication. 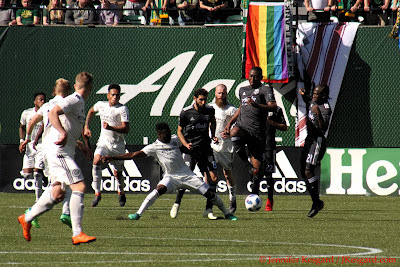 If Portland didn’t take advantage on breakdowns, it could be a very long and tiring match – and there have been plenty of soccer matches where clubs have done that very thing. But stretching the opposition, if done right and consistently, can produce results. Considering the fact the Timbers were nearly even with NYCFC in each shot category and chances, the approach produced exactly what it should have. Savarese believed in his charges, however, and said so during his post match comments. Flores, who has played for Savarese on other sides, has played a wide attacking role before and he paired up with Blanco to provide support to the offense and defense all afternoon. For Chara, he's the pinnacle of defensive midfielders for his ability to create turnovers and distribute the ball, and on several occasions, Chara was right to the spot to deflect the ball or a player away from the goal. I imagine that NYCFC forward David Villa will be having nightmares of Chara chasing him about and knocking him down all the time. Paredes, just 19 years of age, showed maturity beyond his years in making several key passes and creating turnovers at the right time, but he did also show youth with several turnovers and errant passes. The defensive quartet of Valentin, Mabiala, Ridgewell and Powell needed to communicate with each other and stay incredibly organized for the entire match, and as my wife Jennifer put it from her pitch side view, there was constant yelling between the defenders to point out assignments and communicate coverage. The only more vocal player was Attinella, who commanded his line all afternoon to help the Timbers post their first clean sheet of 2018 in his first start. Offensively, the attacking of Valeri and Adi was disruptive for most of the afternoon for the NYC defense, but the duo had plenty of help as Flores, Blanco, Powell and Valentin poured forward as much as they could on the counter. Suffice to say, this was one of the most impressive synchronous efforts I've seen from the Timbers side in my 11 seasons of covering the team. Fanendo Adi celebrates his 38th minute goal in great fashion. 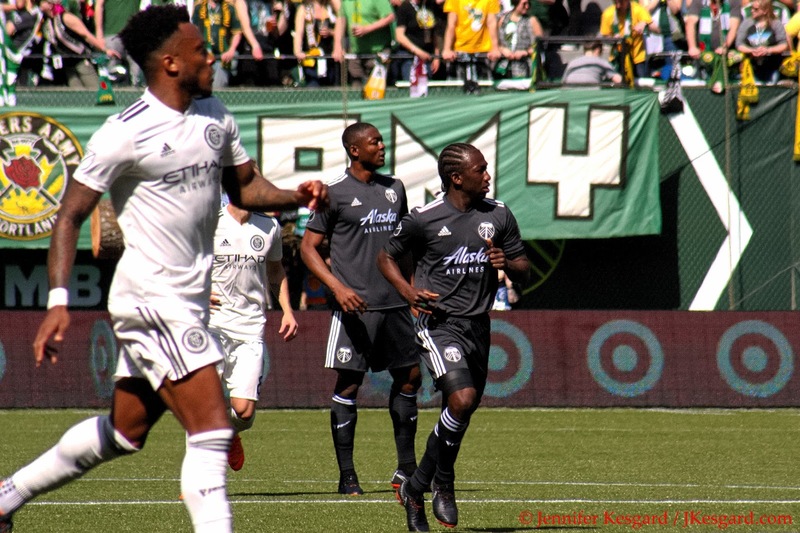 Despite the statistical anomalies of the afternoon, the Timbers' offense ended up yielding an impressive collective of goals. Blanco missed 2 golden chances in the first 5 minutes from close range, while Valeri just missed in the 16th minute off a redirected shot. Blanco got some revenge in the 26th minute when Flores took a throw in from Powell on the right portion of the pitch and crossed it to the left for the Timbers winger. Blanco, small in stature, outleapt his mark and put a looping header over NYCFC goalkeeper Sean Johnson just inside the far right post for a goal. For Blanco, it was his fourth goal of 2018 as he has been one of the team's most valuable attackers and an early candidate for most valuable player. 12 minutes later, the Timbers broke out on a turnover caused by Blanco, and Sebastian fed the ball to a charging Chara. Chara sent Valeri out wide right with a diagonal pass, and the shot came flying into goal that Johnson was initially able to stop, but he deflected the ball right at an awaiting Adi on the left for a very easy tap in for goal 2. Adi timed his run well to avoid the offside flag, and the flag nearly figured into goal number 3 in the second half off a corner kick. Valeri took the restart after NYCFC conceded a corner off a poor clearance, and Valeri spotted Mabiala lurking on the right post for a well placed header past Johnson. Center Official Kevin Stott and VAR had a look at this goal to confirm validity as there were 2 situations that could have wiped it off the books - Flores appeared to be offside with the defensive line in front of goal and was in the eye line of Johnson. However, VAR confirmed that NYCFC defender Ronald Matarrita kept Flores onside as he was defending Valeri on the wing, while Flores ducked out of the way after the shot to get out of Johnson's sight line. NYCFC had their chances on the day as former MLS Timber and now NYCFC forward Rodney Wallace missed a header in the 7th minute by just yards. Villa had a quality miss in minute 40 when they were already down by 2 goals, but the group unleashed a torrent in the second half as Wallace, Villa, Jo Inge Berger, Maxi Moralez and Jesus Medina all had chances on goal from the break through minute 63. However, in each instance, the shot was either deflected away, the threat cleared or Attinella made an easy catch within traffic. Berger and Villa were charging on frame in the 58th minute on one particular play that Attinella stopped by being the first to the ball to scoop it up, and then upend Berger with a well placed tackle. 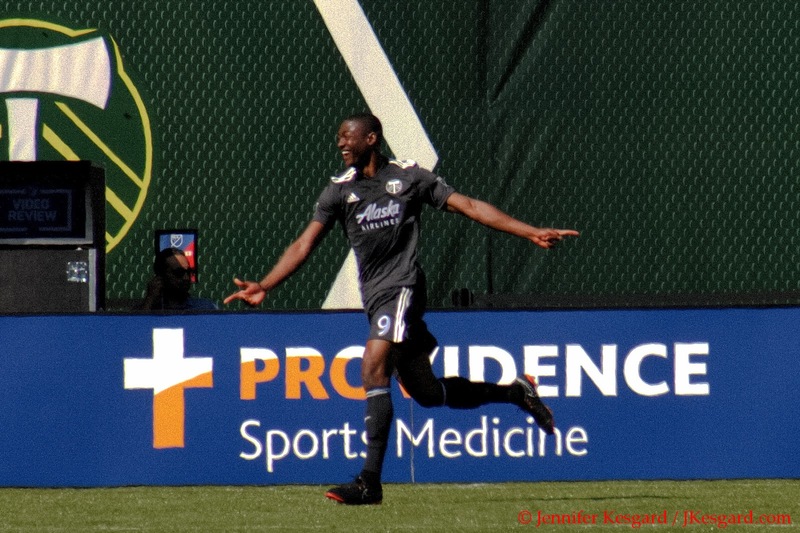 In the 89th minute, Ridgewell blocked a point blank Villa shot on a 1 on 1 attack, and the Timbers defense was able to recover and successfully clear away the threat. Considering the fact that NYCFC had scored at least 2 goals in each of their 7 matches with at least 10 or more shots and they were held scoreless is impressive, and the effort was enough that Savarese and Mabiala both earned MLS team of the week honors for coach and player. In as much as both Gio and Larrys deserved their honors, however, every person indicated how much this result was because of the entire team. This was an entire team effort with every Timbers player contributing to the win. Of the comments made by Savarese after the match, that was what struck me the most - he believed in his team and had faith that any of his players could step into whatever role was needed and succeed. After seeing his team gel over the past few weeks yet struggle to get their first win over Minnesota United last week, Savarese changed up the formula to bring in his veteran goalkeeper, a disgraced defender looking for redemption, a young star in the making, a utility player that is showing his worth, and a scoring trio that has started off 2018 well and getting better. The fact is, however, we could see an entirely different scenario in 2 weeks when Portland travels to San Jose to play the Earthquakes for Cinco De Mayo. Savarese is not married to any specific style, format or player mix, and Timbers fans should expect surprises each time we see that starting eleven appear. He wants the team to show versatility and unpredictability, while causing defenses to have to consider every available option to defend - and if he can pull this off each and every week, it will be exciting and fun to watch. Considering it's a long season and sometimes players thrive in more defined roles, we might start to see some more structure within the attack, but for now, it's one wild ride - and for this afternoon, the strategy produced one of the most impressive and entertaining results of the entire MLS season.